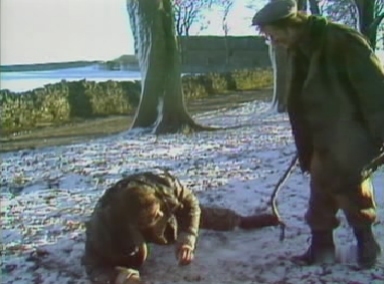 As Charles lays prone of the frozen ground, the figure of Ron emerges from behind a large tree trunk. Childlike he leaps around taunting Charles, waving a stick at him and berating him for being a 'bad doggie'. 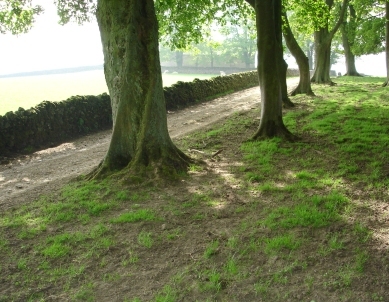 Description: The avenue of trees is located between Air Cottage (Fenton's half-way house) and Ilam Tops Farm (Ellen and Ron's farm) just outside the village of Ilam in Derbyshire. Where is it? : Ilam Tops Farm is reached by an unsurfaced track leading off the road between Ilam and Alstonfield. The entrance to the track (which begins with a cattlegrid) is located on the right hand side near the brow of the first hill after leaving Ilam. The track passes by Ilam Tops Farm before reaching Air Cottage a little further on. 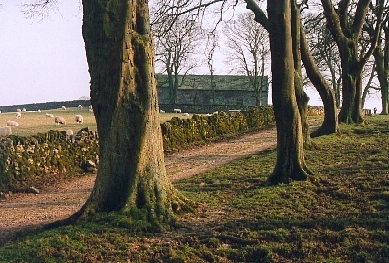 The avenue of trees is clearly visible on the right just past the farm. Where's the best vantage point? : This shot is taken from within the avenue of trees, looking away from Ilam Tops Farm towards a barn at the end of the avenue. What about access? : A public footpath runs down the avenue of trees, so there are no access restrictions — provided the path kept to. Anything else? : There is no approved parking space at or close to Ilam Tops Farm. The very limited parking at Air Cottage is private, and prior permission should be sought before making use of it. Alternatively, park in Ilam and approach the area on foot. The walk from the centre of Ilam is a fairly steep 30-40 minute climb - either by following the road uphill or (for those comfortable using OS maps) taking one of the footpaths up over the fields..